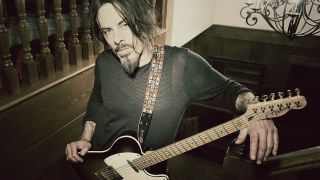 We recently caught up with Richie Kotzen to get his thoughts on technique, tone and general tips for guitar-based righteousness. Here, we take a look at three of his stylistic signatures. This lick is based in the A natural minor scale (A B C D E F G) and uses arpeggios from the key to spell out the chord changes. You can use a combination of your thumb and first two fingers of your picking hand to articulate the notes - just use what feels comfortable to you. Taking our inspiration from The Winery Dogs’ I’m No Angel, the idea here is to hold each bend then add the string above it before re-picking the bend. Use your second finger to play the 4th fret notes on the fifth and sixth strings, then use your third finger to bend the notes on the second and third strings. This lick is based in the E minor pentatonic scale (E G A B D). In bar 1, use your thumb to pick the notes on the fifth string and your first and second fingers to pick the higher notes. In bar 2, move your fingers up to the next set of strings and follow the same pattern.